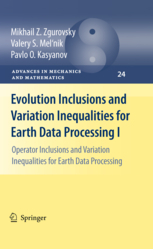 Two volumes of ''Evolution Inclusions and Variation Inequalities for Earth Data Processing" (authors: Zgurovsky Mikhail Z., Mel'nik Valery S., Kasyanov Pavlo O.) were published by Springer. In which our researchers present modern mathematical methods to solve problems of differential-operator inclusions and evolution variation inequalities which may occur in fields such as geophysics, aerohydrodynamics, or fluid dynamics. For the first time, they describe the detailed generalization of various approaches to the analysis of fundamentally nonlinear models and provide a toolbox of mathematical equations. These new mathematical methods can be applied to a broad spectrum of problems. Examples of these are phase changes, diffusion of electromagnetic, acoustic, vibro-, hydro- and seismoacoustic waves, or quantum mechanical effects.